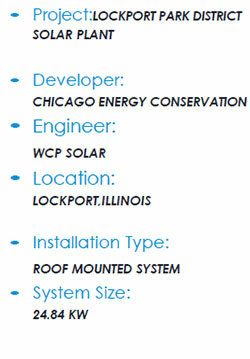 WCP Solar was contracted by Chicago Energy Conservation Inc. to construct a roof mounted solar system on a Lockport Park District Facility located in Lockport, Illinois. This grid connected system ties directly into the Commonwealth Edison Utility’s (ComEd) power grid and generates enough electricity to provide 56% power electrical needs of the facility. The project was sized at 24.84-kWp1, using 108 SW-230 Solarworld photovoltaic panels rated at 230-W mounted on a 10 degree tilt on a slanted metal roof. The system also employs 2 Fronius string inverters rated at 10.0-kW, to convert the DC energy produced by the solar plant into AC energy. In addition to providing significant energy savings, the solar system will produce approximately 32 Solar Renewable Energy Credits (SREC's)annually. WCP Solar construction management team oversaw all phases of the construction process, including the day to day operations, site monitoring, quality assurance and control, and scheduling. Installation was completed in 5 days. Completed on May 30th 2014, this project was another example of strong project management and leadership by the WCP Solar team. 1 Estimated production of over 753 Tons of CO2 - Equivalent to planting over 17,812 trees or driving reduced by 1,542,787 auto miles or 72,478 gallons of gasoline.